Continuing my series on Fiori elements … you’ll find more blogs in the Fiori elements wiki. Progress indicators are an effective way to show progress towards a goal or to compare actual and target values. Here we see how to apply percentage progress bars using a Fiori element List Report app as an example. When you want to your business users’ to understand how close they are to a goal, progress indicators are an easy to understand addition to your Fiori elements apps. Users can see and understand at a glance how far they (or a business object) have come or have yet to go to an amount or value. In the example below % Gross of Target column compares the Total Gross Amount to a static target value of 30K. Notice that order 500000005 exceeds 30K and so shows as a full 100% bar. You can of course provide the percentage as a property of your OData entity. Ideally it should be between 0 and 100. If you return the percentage value, then the progress indicator will show the percentage as the text, e.g. “75%”. Alternatively you can have the UI calculate the percentage, in which case the progress indicator will display the actual and target values as a <actual value> of <target value> text, e.g. “15 of 20”. You can compare a value or amount property from your OData entity to a static target value or amount. The static value can be set from a property of an OData Service entity or set in the app itself. Or you can compare your value or amount to a dynamic target value, by nominating one OData property as the value and another property as the dynamic target value. Of course the two properties need to be comparable, i.e. they should both be values or both be amounts so you are comparing like to like. The calculation does not need to return a whole number – decimals are ok. Nor does it need to be limited to 100% – if the percentage exceeds 100% it will simply show that the progress bar is full. The following example from the SAPUI5 Software Development Kit documentation on Adding a Progress Indicator to a Table shows the percentage and absolute target value variations side by side. DataPoint is a term borrowed from the world of analytics. A datapoint is a single fact or measurement that can be represented numerically or graphically. For our percentage progress bar that single measurement is our percentage value. For Fiori elements apps, a DataPoint is also a special annotation that can be defined once and then reused in multiple places in the same app. For instance you might want to show the progress bar in both your List Report and in your Object Page. So you can create your DataPoint once as its own annotation and then reference your DataPoint annotation wherever you need to use it. As with most UI annotations you can create them in your OData Service or in a local annotations XML file of your Fiori element app. In the examples below you can see what this looks like for comparing a value to a static target. If you want to include it in an OData Service based on ABAP CDS as usual the recommended way is to include the DataPoint annotation in a metadata extension of your CDS View. You can actually include both the datapoint and the reference to the data point together. Tip: You might be wondering what to do if you have more than one data point annotation? Just use the Qualifier annotation property to distinguish between them. Once you have created your DataPoint annotation you need to reference it wherever you want it to appear. Once again you can do that by specifying the annotation in your OData Service or in your local annotations XML file. Now just run your app! If you want to find out more on how to use the Annotation Modeler, you might like to look at some of our Annotation Modeler in SAP Web IDE videos on Youtube. And you can find more information via Developing apps with SAP Fiori elements in the SAPUI5 SDK and ABAP Programming Model for Fiori in the SAP Help Portal. Brought to you by the S/4HANA RIG. Thanks for another great blog. But after watching videos on ABAP programming model for Fiori and the blogs in this space, I have a question is it future? So, can we ignore UI5 and just concentrate on Annotations. Kindly reply it would be very helpful to us as we build up our skills and the skill of the team. So many of our SAP S/4HANA and SAP S/4HANA Cloud apps are now created this way. I have even heard Product Owners tell us directly that they have moved away from freestyle apps to Fiori elements apps because of the savings in maintenance effort. So yes Fiori elements have a strong future direction. 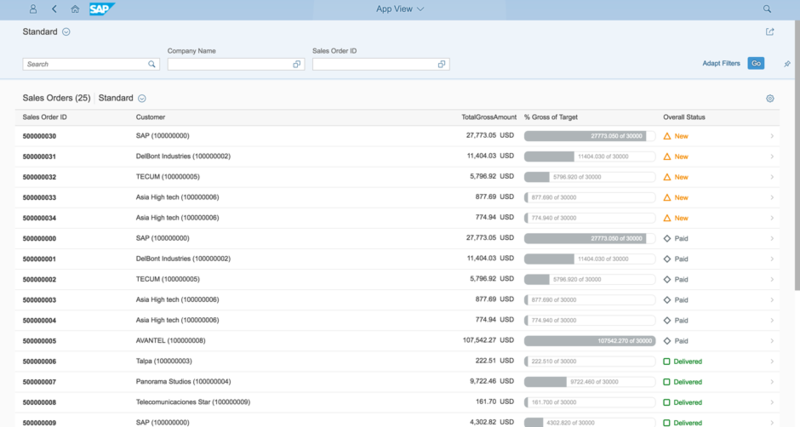 Instead when you have an app design that fits one of these common use case patterns (we have 4 so far – list report, object page, overview page, and analytical list page) you at least consider using Fiori elements rather than creating a freestyle app. How to provide percentage as a property for Odata entity so that progress indicator directly shows %? You just need to provide a numeric value between 0 and 100. The % will be added automatically. I am currently trying it out and might have spot a mismatch between the screen shot of the annotation modeler and the XML Editor where you define the data point. Whereas in the screen shot you have choosen the value to be a string(i18n) rather than a path. When using string(i18n) it doesn’t work. When choosing path it does.